Matthew Morrison has proven his leadership abilities both in the U.S. Navy and at the University of South Florida. 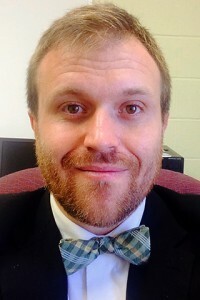 As a new assistant professor of electrical engineering at the University of Mississippi, the award-winning teacher and researcher is overseeing the department’s new emphasis in computer engineering science. A three-time alumnus of USF, Morrison will be teaching Advanced Digital Design this fall and CMOS/VLSI next spring. His other courses scheduled later include Low-Power Digital Design, Digital Circuit Synthesis, VLSI Algorithms and Design, Testing and Fault Tolerance, Embedded System Design, Foundations of Hardware Security and Foundations of Engineering. As a graduate assistant at USF, Morrison taught seven classes totaling 391 students. Awarded the Provost’s Award for Outstanding Teaching by a Graduate Teaching Assistant, he implemented many of the teaching methods developed at Naval Nuclear Power School, which he found engendered greater creativity in students. Morrison’s research is in the areas of CMOS/VLSI, embedded systems, low-power hardware design and hardware security. Ramanarayanan Viswanathan, chair and professor of electrical engineering, said he is pleased that Morrison accepted the position here after completing his doctorate in May. Morrison won the Navy Club of the United States Military Excellence Award in U.S. Navy Recruit Training. The award is presented to the graduating recruit who best exemplifies the qualities of enthusiasm, devotion to duty, military appearance and behavior, self-discipline and teamwork. While a USF student, Morrison was involved with the Student Bulls Club, which is the student athletics fan group. He attended many home games for football, soccer, baseball, basketball, softball and tennis. He enjoys watching late-night comedy shows and “Doctor Who,” attending blues concerts, running and biking. His parents, Alfred and Kathleen Morrison, live in North Venice, Florida, and are the chief scientist and chief financial officer, respectively, of Missile Systems Engineering. Morrison’s brother, James, is a project manager for Walsh Group and is working on the new U.S. Embassy in Oslo, Norway. Morrison has authored several refereed journal articles and holds memberships in the Institute of Electronic and Electrical Engineers and the Association of Computing Machinery.